World Headlines: The Financial Cost Of Typhoon Haiyan : Parallels A regional governor in the Philippines says the devastation from the storm will cost $14 billion. Preliminary estimates say economic growth could be hit by as much as 1 percent. In other news, Russia wants an apology from Poland; and an Egyptian soccer player is in hot water after expressing support with ousted President Mohammed Morsi. 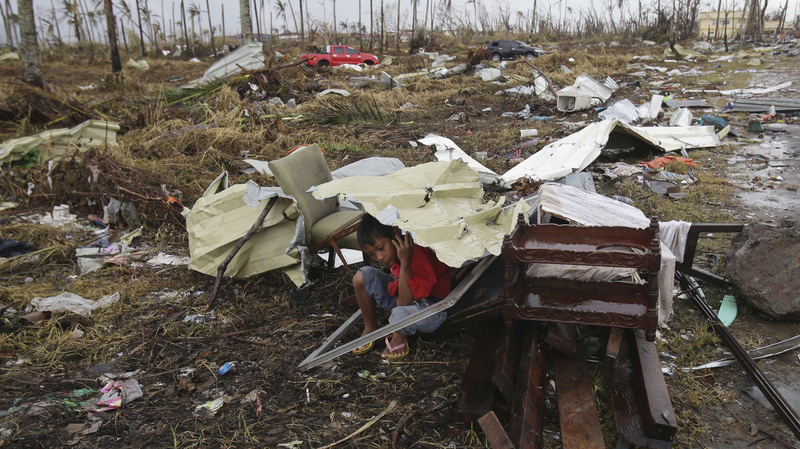 A young survivor uses the remains of a house to shield him from rain in Tacloban, Philippines, on Tuesday. Four days after Typhoon Haiyan struck the eastern Philippines, assistance is only just beginning to arrive. Authorities estimate the storm killed 10,000 or more. The devastation from Typhoon Haiyan could cost the Philippines economy $14 billion, according to one estimate. "This will have a major punch on the fourth quarter GDP this year, but it will have its full impact lag into 2014," Joey Salceda, the governor of Albay province, a hard-hit area, said in a statement. He's also an economist who was recently elected chairman of the U.N. Green Climate Fund. The numbers, he said, were based on Bloomberg estimates. In a separate story, the newspaper reported that the regional economies of the areas worst affected by Haiyan (which is known as Yolanda in the Philippines) could shrink by as much as 8 percent next year. National economic growth could be hit by as much as 1 percent. Both those figures are preliminary estimates, the country's finance secretary said. The Philippines economy has until recently bucked the regional slowdown, growing by 7.6 percent in the first quarter of this year. Russia's Foreign Ministry has demanded an apology from Poland after rioters in Warsaw attacked the Russian Embassy. The Foreign Ministry summoned Polish Ambassador Wojciech Zaionchkovskii over Monday night's March of Independence in which far-right protesters set fire to parked cars and threw fireworks in the center of Warsaw. The Russian Embassy was among many targets. Rioters set fire to an empty booth at the fence around the embassy. They threw flares, stones and bottles at nearby parked cars, and onto the embassy ground and buildings. Fifty people were arrested, and Polish officials condemned the rioters. Russia accused Polish police of "passivity" during the incident. The Polish Foreign Ministry expressed "deep regret" at the attack, which it blamed on ultra-nationalists. An Egyptian soccer player is in trouble for displaying a four-fingered hand signal, which is associated with ousted President Mohammed Morsi, after scoring a goal on Sunday. The Al-Ahly team said it would suspend striker Ahmed Abdel-Zaher for displaying the so-called Rabaa salute in Sunday's final of the African Champions League against South Africa's Orlando Pirates. Al-Ahly said the striker would be left out of next month's FIFA Club World Cup in Morocco. He'll also be investigated by the Egyptian Football Association. Egyptian Sports Minister Taher Abou-Zeid downplayed the incident Sunday, saying all that mattered was that Al-Ahly had won the African Championship. On Tuesday, Abedel-Zaher's agent said the striker would apologize for flashing the symbol that expresses support for Morsi. The ousted Egyptian president, who drew his support from the Muslim Brotherhood, was removed from office in a coup in July. Since then, the military-backed government has cracked down on his supporters. The incident is the latest involving the Rabaa salute and an Egyptian athlete. Last month, kung fu champion Mohamed Youseef was banned from representing his country's in the world championship after he wore a T-shirt with the symbol. On Sunday, he was banned from all competition for a year.